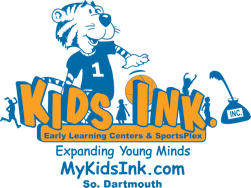 We have two locations, Kids Ink Too at 695 Dartmouth Street and Kids Ink at 728 Dartmouth Street identified on the map below. You can also call or email us at anytime, our hours are Monday – Friday, 7:00 AM to 5:30 PM. You can also use the handy form below to send us a message.